eCollege is a Pearson product that provides an efficient and interactive learning experience in the college atmosphere through a number of solutions. One of these tools is the software Learning Studio, deemed as a highly developed, scalable and dependable SaaS learning system. 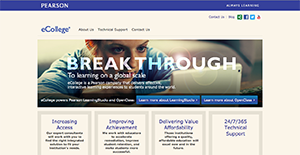 As a leading e-learning provider, eCollege makes use of expanded blended learning, which combines face-to-face and virtual learning modalities for an enhanced learning experience. At the same time, there are also available tools to keep track of a student’s learning progress. It also provides full-service educational solutions such as for development resources, and the experience of a leading education company in the matter of covering content, technology services, and support, which in turn helps maximize the resources of an educational institution, without breaking the budget. In addition, eCollege is designed to benefit students through solutions that would help improve student outcomes and increase student retention in schools. eCollege also supports adult learning initiatives as well. Enterprises have unique wants and requirements and no software platform can be perfect in such a condition. It is pointless to try to find an ideal out-of-the-box software product that fulfills all your business requirements. The intelligent thing to do would be to customize the solution for your specific wants, worker skill levels, budget, and other aspects. For these reasons, do not hurry and invest in well-publicized popular solutions. Though these may be widely used, they may not be the ideal fit for your unique requirements. Do your research, investigate each short-listed system in detail, read a few eCollege reviews, contact the maker for clarifications, and finally settle for the product that provides what you want. How Much Does eCollege Cost? We realize that when you make a decision to buy Learning Management System - LMS it’s important not only to see how experts evaluate it in their reviews, but also to find out if the real people and companies that buy it are actually satisfied with the product. That’s why we’ve created our behavior-based Customer Satisfaction Algorithm™ that gathers customer reviews, comments and eCollege reviews across a wide range of social media sites. The data is then presented in an easy to digest form showing how many people had positive and negative experience with eCollege. With that information at hand you should be equipped to make an informed buying decision that you won’t regret. What are eCollege pricing details? What integrations are available for eCollege? If you need more information about eCollege or you simply have a question let us know what you need and we’ll forward your request directly to the vendor.